Billy_Mayes, that does not belong in this thread. 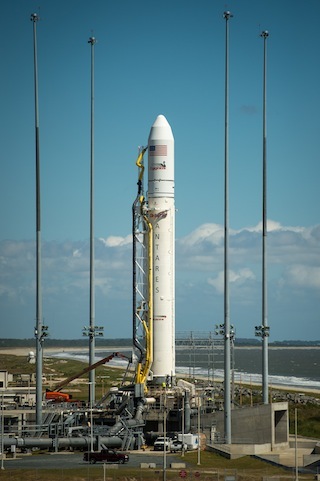 Just a reminder to everyone, Orbital Sciences' Cygnus COTS demo flight to the ISS is launching today from Virginia's Mid-Atlantic Regional Spaceport (MARS), at 1450 UTC (1050 EDT), or 4½ hours from now. You can watch it live on NASA TV on NASA's website, or on other streams that some spaceflight news services might be hosting. Cygnus is currently scheduled to rendezvous with the ISS tomorrow morning. NASA TV coverage will start at 4:30 EDT (8:30 UTC), with capture scheduled for 7:15 EDT (11:15 UTC). Berthing will occur in the hours that follow capture. UPDATE: Cygnus rendezvous coverage on NASA TV has started. Apparently this flight was also the last planned flight of Grasshopper; next they will begin testing of the F9R development vehicle with low altitude testing in Texas, followed by high altitude testing at Spaceport America in New Mexico! I assembled a graphic comparing two potential launch options for Dream Chaser: the Atlas V with dual-engine Centaur, and the Falcon Heavy with reusable cores. Atlas V and Dream Chaser graphics are © Giuseppe De Chiara (source), Falcon Heavy graphic © SpaceX (source), modified by me to match the scale and visual style of the Atlas and Dream Chaser graphics. Scale at full resolution (click image for link) is 1 inch per pixel. SpaceX announced that it will begin testing of its next generation methane-fueled rocket engine called Raptor at Stennis Space Center early next year. Raptor will be more efficient and roughly three times more powerful than SpaceX's current RP-1 fueled Merlin 1D engine. Sierra Nevada's Dream Chaser made its first free flight test today. It was dropped from a helicopter and glided to a runway at NASA's Dryden Flight Research Center / Edwards Air Force Base. The flight itself went perfectly, but due to a malfunction in the left landing gear the vehicle flipped over after landing. The extent of the damage has not yet been revealed. I really like the design of the Dream Chaser. I think the design of the Dream Chasers wings is a bit strange, expected them to turn downwards. Why? That would make no sense.